I had a temporary crown installed yesterday. So when we found leaks in our window frames it only made sense to reach for the Dremel tool. Closest thing we’ve got to a de-tootherizer. 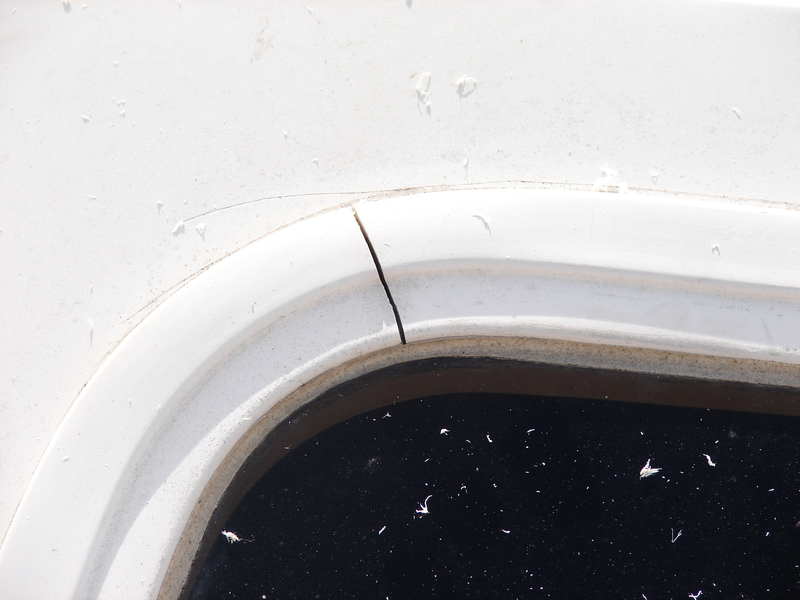 The vinyl window frames shrank in the harsh Bay Area sunshine, opening the welds first and then cracks in the corners. 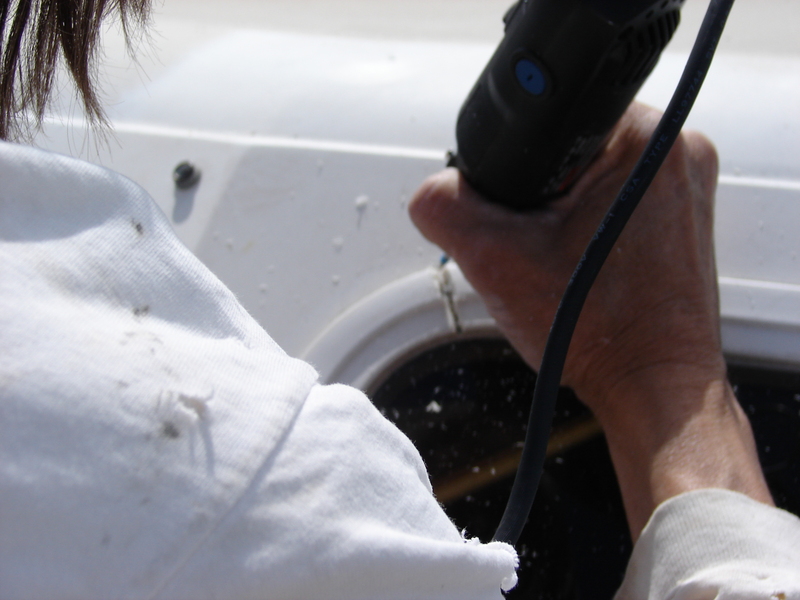 A little time with the high-speed cutter opened and cleaned the crack. 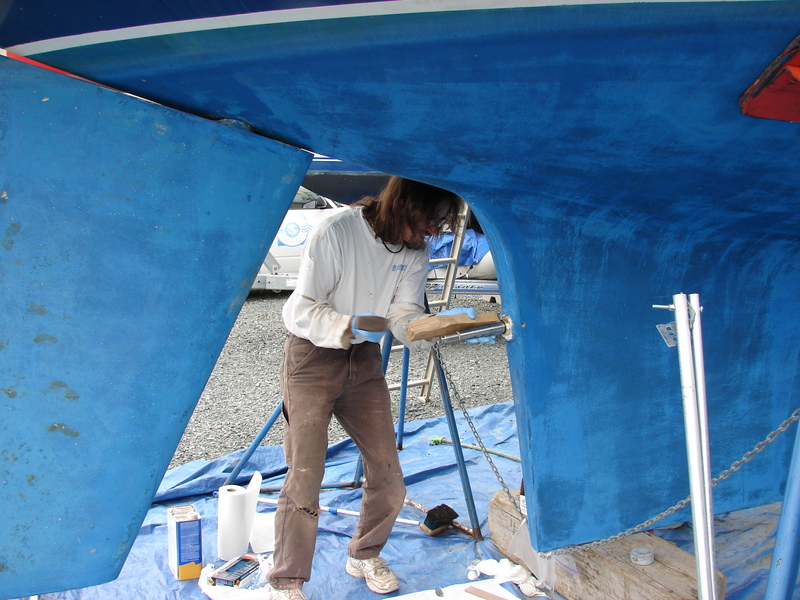 Then we masked off the area and smeared in BoatLife polysulfide caulk. Perhaps a polyurethane would have been a better choice. Hard to say. The interesting thing about this caulk is it takes almost a week to cure. Same as my tooth. Permanent crown next Thursday. Hopefully we’ll install our engine on the next day. Stay tuned. 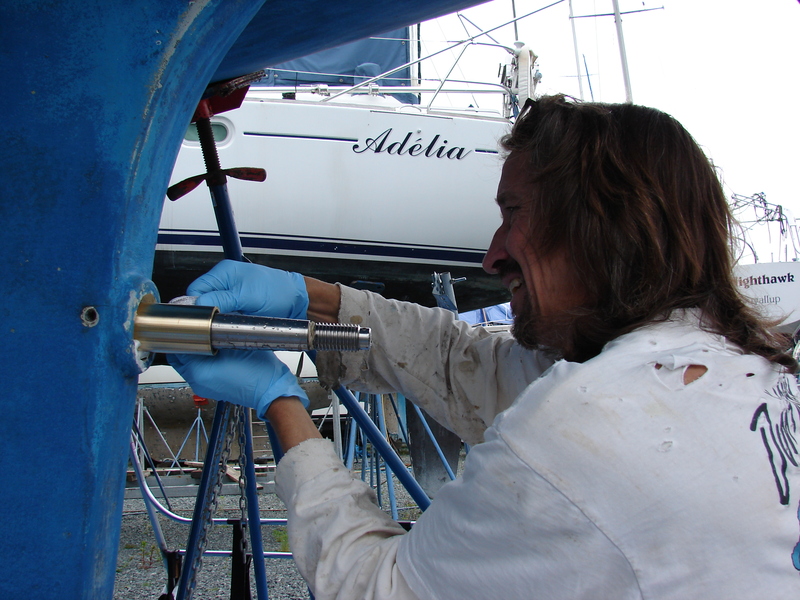 Here’s how we re-bed stanchions on this boat. 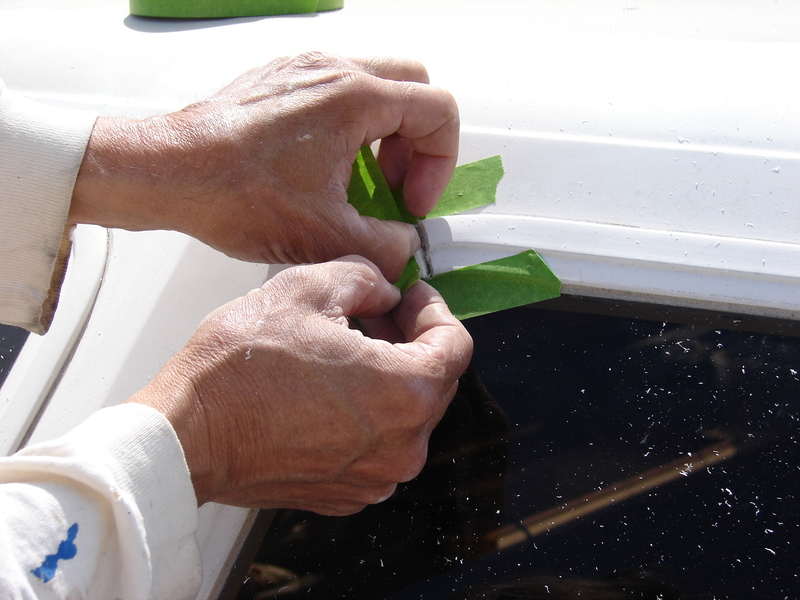 First we find Butyl tape. Not at the marine store. Perhaps we should take the hint. 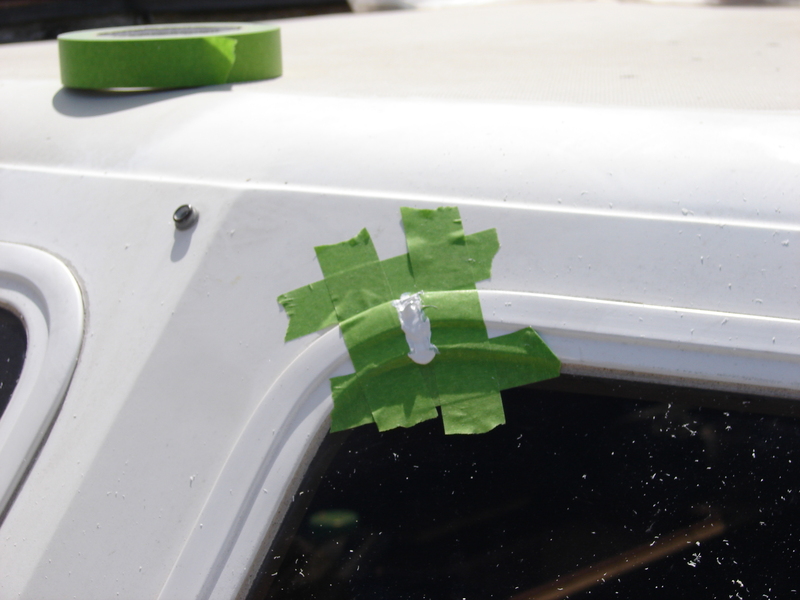 But butyl tape is found at the RV store. Butyl is uncured rubber, I think. It stays sticky and rubbery forever. Perhaps forever-ish. 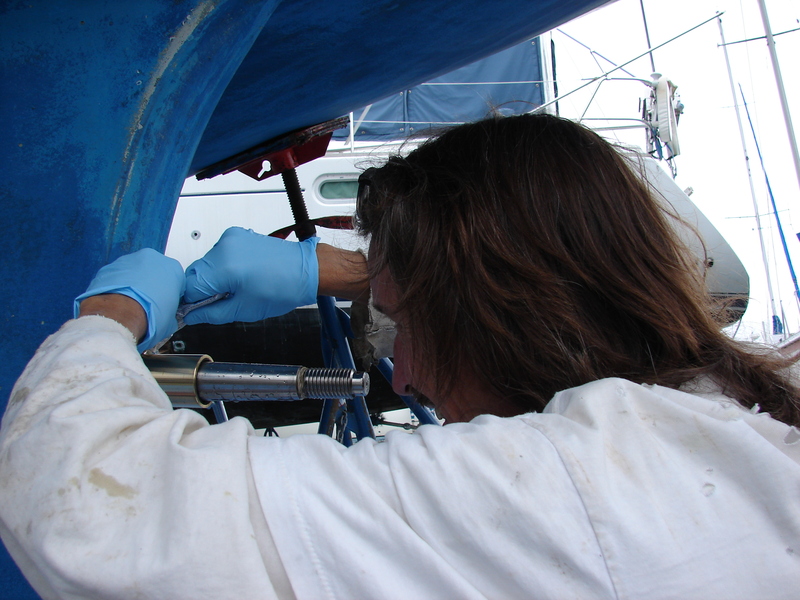 So first we pull the stanchion fasteners and clean the incredible mess we find underneath. Nancy is wearing a funny hat because she was painting and doesn’t like getting white paint in her not-yet-grey hair. Personally I think she looks great either way. 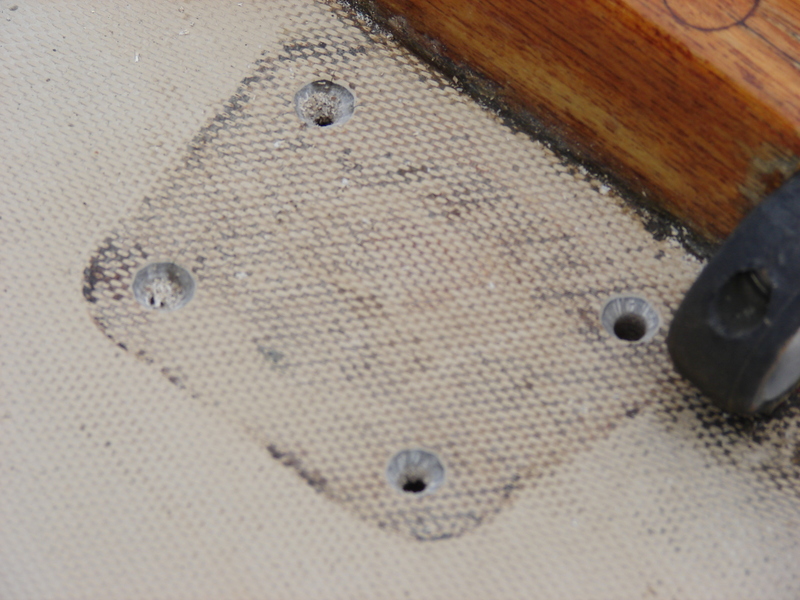 Once we get the area clean we countersink the fastener holes. Clean is a relative term. 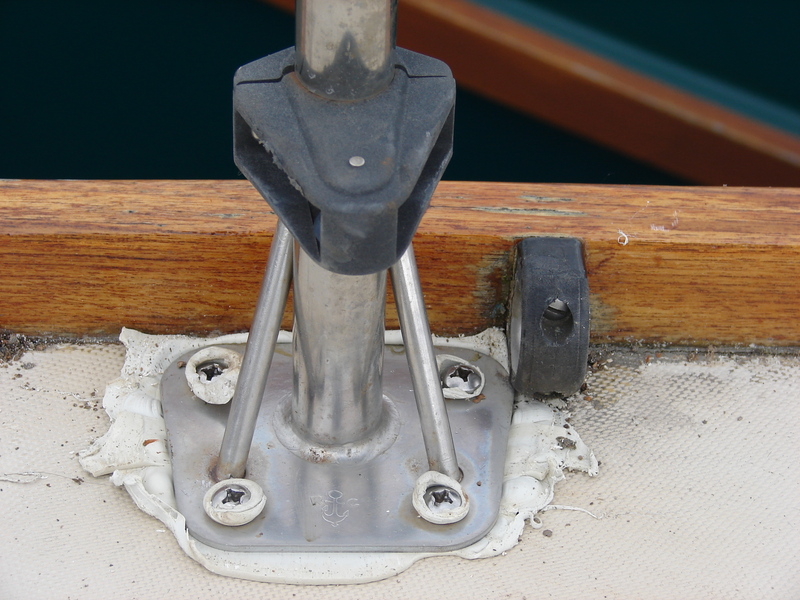 Then we cover the area with slabs of butyl tape and replace the stanchion base. 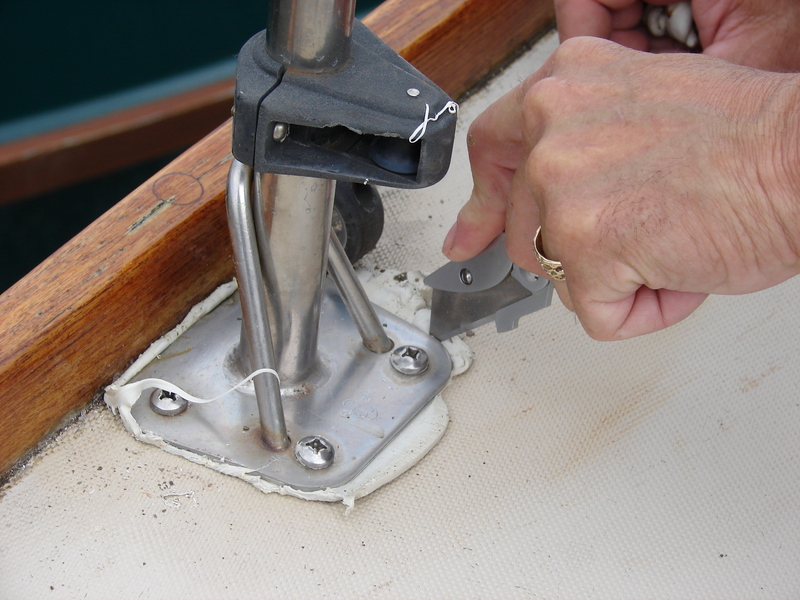 We wrap a little material under the fastener head, then push the fasteners through the tape into the holes. 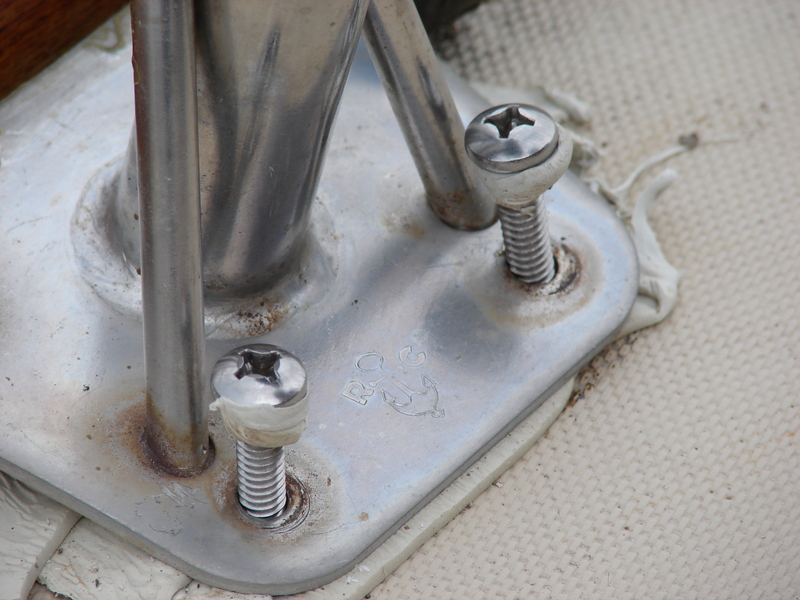 Snugging the fasteners squeezes most of the butyl out of the fay gap (an aerospace term meaning the between part), but leaves little loops of butyl in the countersink spaces around each fasteners, filling the threads and sealing the deck. 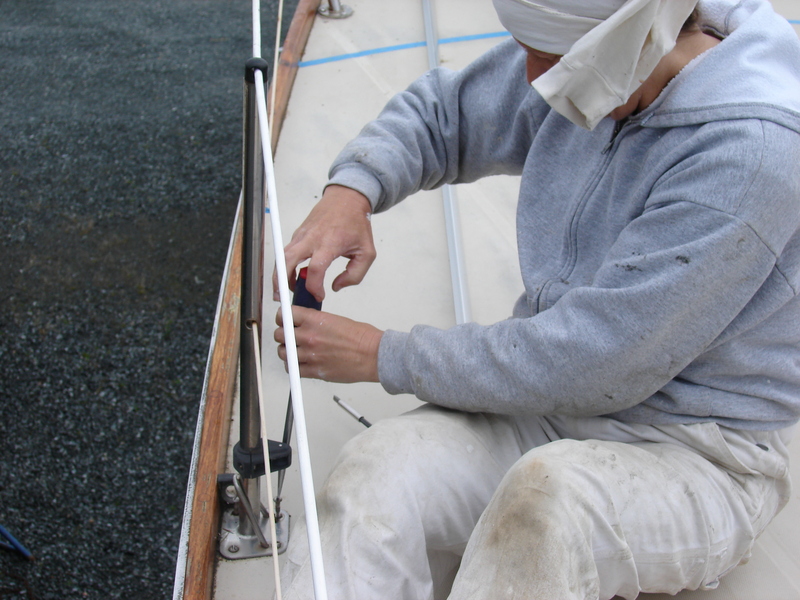 We finish by scoring a line around the stanchion and peeling the goo off the deck. If we don’t smear it it comes off pretty easy. Actually it keeps oozing for a few more hours. No biggie, just clean it again. It’s like that soft blue gooey eraser stuff.